The Fundamentals of Critical Care Support is a two-day comprehensive course addressing fundamental management principles for the first 24 hours of critical care. 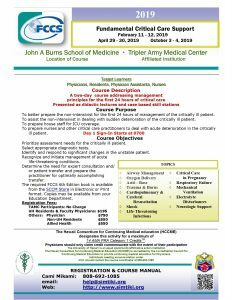 The purpose of the course is to assist the non-intensivist in dealing with sudden deterioration of the critically ill patient; to prepare house staff for ICU coverage; and to prepare nurses and other critical care practitioners to deal with acute deterioration in the critically ill patient. Targeted learners include physicians, residents, physician assistants, nurses, respiratory therapists, paramedics and EMTs. Cost: $195 for JABSOM faculty and residents; $750 for physicians; $550 for other allied health professionals. For additional information and registration email help@simtiki.org. The Hawai’i Consortium for Continuing Medical Education has designated this live activity for a maximum of 14.0 AMA PRA Category 1 Credits (TM). Physicians should only claim credit commensurate with the extent of their participation.